My frustration with the numbers out on most sleep sites is the overwhelming amount of research published with the amounts of sleep. So I am giving you a few charts from different resources on the amount of sleep infants and toddlers (and through childhood) actually sleep. These included both measured and/or recommended amounts. 1. Richard Ferber's measured amounts. This chart was created based on a chart from the Harvard Child's Sleep Lab and Richard Ferber's Book Solve Your Child's Sleep Problems. This is the chart I refer to the most often. It has the best breakdown of ages, day to night divisions of sleep, ranges and averages for sleep amounts. For most parents this will be the most helpful chart. 2. This is a graph from an analysis of 23 studies done on the amount of sleep in childhood. The vertical lines show the range of measured sleep at each age. The dot on the line shows the average amount of sleep at each age. You will notice the range of sleep is much larger in early infancy and gets smaller as a child gets older. This chart is hard to read the total averages. I like how it shows the variability of sleep at each age. 3. 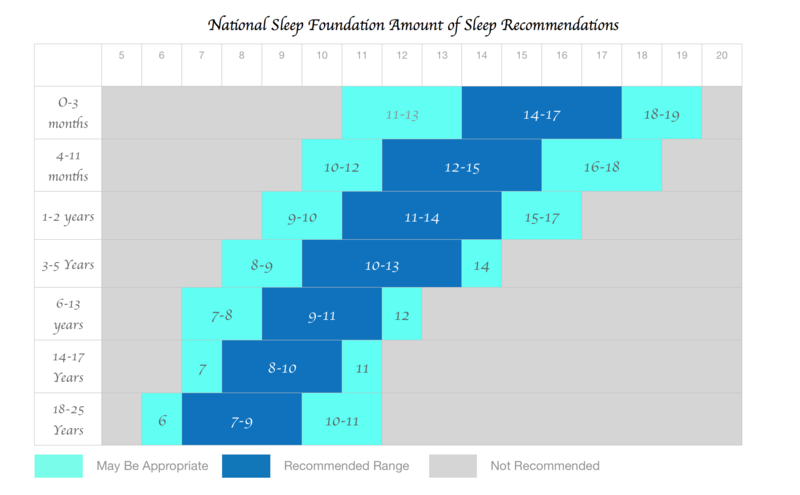 I created this chart based on the chart on the National Sleep Foundation(NSF) website. Click here to see the original chart. 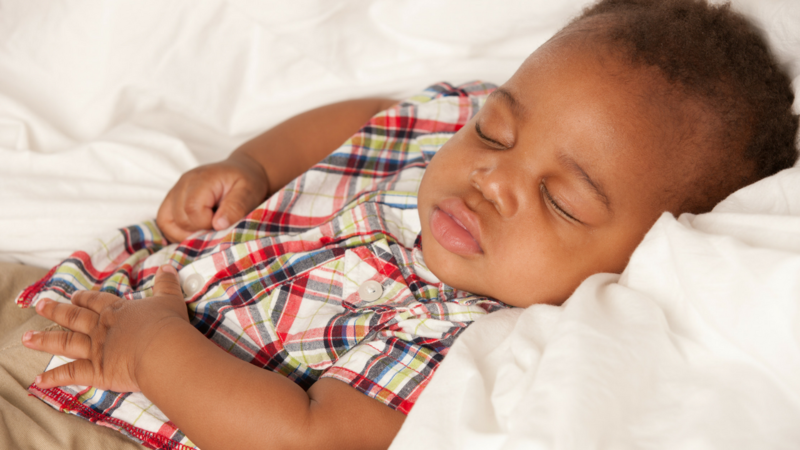 The NSF recently undated their numbers to reflect the latest research on infant and toddler sleep. I love that this chart provides "may be appropriate" numbers. This shows the large range of normal outside the recommend amounts. 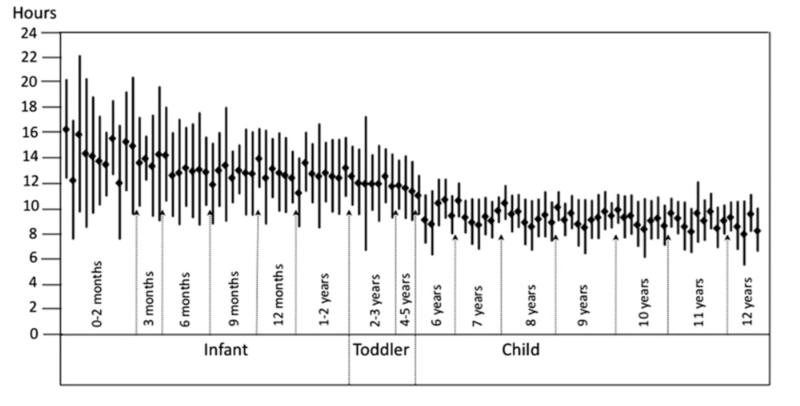 The problem with this chart for parents of infants is how it lumps together the ages 4-11 months. The difference in sleep need and want from 4 months to 11 months is huge. Putting these ages into one group skews the data. The higher numbers only apply to the younger months. Lower numbers only apply to infants over 6 months. 4. This chart is the average sleep totals of infants and toddler across different countries. 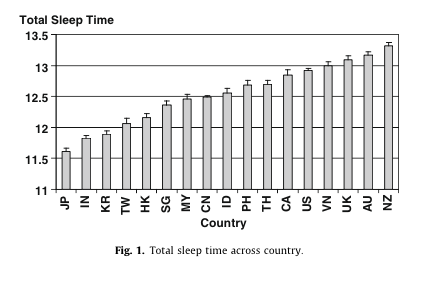 I love how the rage between countries reflects the average range of sleep for infants and toddlers; 11-13 hours. This for me solidifies this sleep range. If the averages from countries around the world creates the same rage of normal, it takes the cultural differences in attitudes of sleep from impacting the numbers. The one aspect of these numbers I find interesting is the relationship of the sleep totals to the rate of SUIDs (Sudden Unexpected Infant Death, formally SIDs). Japan has the lowest sleep average and the lowest SUIDs rates. New Zealand has the Highest sleep average and the highest SUIDs rate. Could there be a correlation? I would love to see some reasearch. 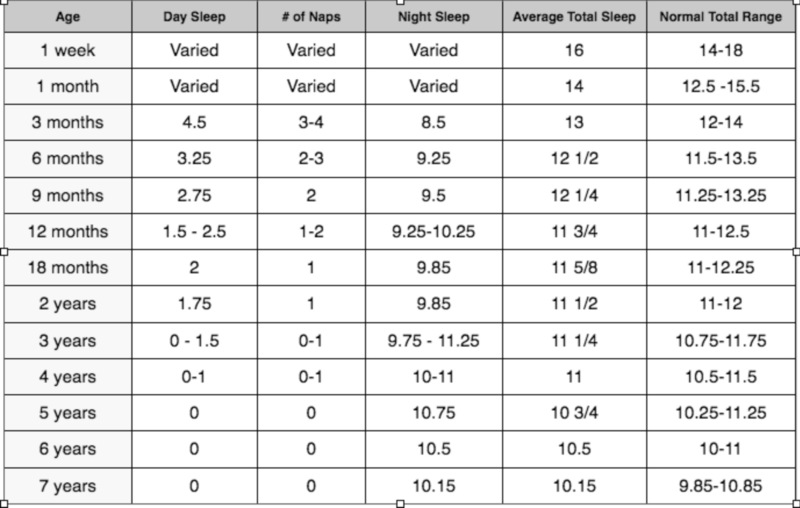 It is important to remember, the numbers in all the charts are the total sleep amounts in a 24 hour period. Only the first chart includes information about day versus night time amounts of sleep. I usually recommend tracking the 24 hour amounts of your child's sleep from wake time to wake time. Wake time is when the system reboots. When the curtains open, or the lights go on, the brain hormones change indicating the start of the day. This is why we limit light exposure at night. I could launch into another entire discussion about the hormones. But I will save that for another day. In most cases, babies get the sleep they need. If there is a problem it's usually in the organization of the sleep. If your baby is getting much lower then the sleep amounts, there could be an overtired issue impacting sleep. Do you have further questions about sleep? Join in Live Online or In Person at my office for a Sleep Support Groups. Learn More.